We are, at times, a strange brew. But this is what works for us — and inevitably, it works for our clients. The types of people who work at PARAGRAPH are strategists, anthropologists, artists, engineers, entrepreneurs, negotiators, students and builders. This makes every day an interesting one at PARAGRAPH. We exist to provide an alternative to research and strategy that is either uninspired or over-intellectualized. We want to partner with people who want to be the best, to be associated with companies of quality and conscience and ethics. Currently, we are looking to add an Analytical Strategist to our eclectic mix. "What's an Analytical Strategist and is it possible I am one," you ask? Please review this job description and if it reminds you of yourself, let us know. On-stage dynamics range from warm to conciliatory to venomous. There’s the writer whose partner in dialogue has been a close friend for years. On the other extreme, there are the panelists who shoot each other withering looks and, after the first question, refuse to acknowledge the moderator’s existence. Despite these underlying tensions, the weekend unfurls without major incident. And it’s clear that the no-apologies nature of both the program and the crowd make the entire event more provocative. Middle-grounders they are not, making the experience of being there more memorable. It turns into a series of bold conversations about what might be next and what’s starting to bubble up, not about ideas that have been done and that feel tired. Risk-taking is in the air, and the non-threatening has no place. It was fitting, then, that all of the talks I attended last Friday through Sunday pointed to the question of how to maintain a certain level of intensity without losing oneself or one’s message in the process. The issue wasn’t about balance or compromise; it was about how to exist on a knife’s edge without falling off one side or the other. Whether directly or through my own interpretation, each conversation I heard demonstrated that it’s there on the precipice where the most exciting stuff happens—but that it takes focus and periodic reassessment to stay there. As the weekend pulsed on, the same types of questions cropped up no matter what the topic at hand. Still, what struck me as key takeaways fell into three main buckets: (1) broader societal and cultural trends; (2) how messages are transmitted and received; and (3) the ways of work that appear most effective for some of the people we most admire. For Malcolm Gladwell, a central concern in his talk was how to create societal mechanisms that help stop people from getting screwed without going so far as to constrain the healthy running of society. If we want to make it less likely for the Bernie Madoffs to get away with fraud, but we also don’t want to foster a culture of suspicion or authoritarianism, what’s the narrow path forward? A panel about income inequality considered the argument that the so-called elites of American society used to be bound by a code of “seemliness” that kept excess in check, and that the loss of the common narrative emerging out of World War II has eroded that code, making the upper echelons ever more disengaged from the rest of us. With that problem posed, it’s worth asking: In an era where the American cultural experience is so fragmented, where could another powerful, lasting, and positive common narrative come from? After a panel discussion among writers whose work revolved around the quirks of Florida lore, I was left with one question: What makes a story or a place weird enough to fascinate us, but not so weird that it’s simply off-putting? In other words, where is the line where weird stops capturing our imagination and becomes a joke? During a retrospective on the work of cult classic filmmaker Roger Corman, a lesson emerged around how messages get packaged. Namely, Corman had learned to consider: How can I convey what I want to in this movie without sounding preachy? How can I put this story forward in a way that still packs a punch yet makes viewers feel like they’re in on the joke? Jeremy Denk suggested in his talk that what makes good comedy (and classical music, for that matter) tick involves having recognizable “types” that allow an audience to follow a plot however those basic elements interact with each other. Using examples from Seinfeld, Portlandia, and various pieces for the piano, he raised the question: How can you incorporate powerfully resonant building blocks into your storytelling in a way that leverages shared experience without being too obvious or formulaic? In a panel about cannabis legalization, yea- and naysayers carried on a spirited conversation. At the same time that their distinct points of view made them passionate speakers, they struggled to find common ground and spent most of the 90-minute session talking past each other. For the audience, the issue became: What lets you become skilled at making an ardent case for something while also being open to constructive debate? A late-night screening for the new film Listen Up Philip let the audience in on a story whose apparent protagonist was a thoroughly caustic, narcissistic character. In my observation of the film, there was nothing that made me want to root for this guy—nothing that evoked empathy as he tumbled toward self-induced misery. The possibility of schadenfreude also passed me by as I was too distracted by this dude’s foulness to revel in his pain. I don’t doubt that others connected to this film more than I did, but I’m left with the following question all the same: If polarizing characters can inspire more passion and evoke more interest among audience members, when do unlikeable personalties cross a barrier where they just become a reason to stop watching? Before Bill Hader took a turn into comedy and, as Bill Murray recently put it, “did the best work anyone ever did” on Saturday Night Live, he was intent on being a director of "serious" films. Recounting how he made the switch, Hader recalled the decision he faced: Should I keep on doing something that isn’t quite working out, or should I put all of my energy into this thing that people tell me I’m good at? Instead of sliding back into a comfort zone, he saw an opportunity that scared him and went after it. Roger Angell, a living legend at the magazine, spoke of the determination that allowed him to become the celebrated baseball writer that he is today. In the 1990s, the professional focus that he had acquired was stretched when then-editor Tina Brown challenged him to write something about his personal life—something he hadn't done previously. This anecdote points to the question: How can you be single-minded enough to achieve your goals and yet stay vulnerable and keep learning? So, in the end, the most interesting people in the room probably didn’t reach that pinnacle by seeking balance in their lives. But neither did they go at it so hard that they fell off the deep end. Their willingness to take risks was bolstered by hard work and kept in check by the sorts of questions above—the ones that can help all of us alternately stoke and check whatever it is that keeps us going. The PARAGRAPH Project is a marketing research and strategy firm based in Durham, NC. We are, at times, a strange brew. But this is what works for us — and inevitably, it works for our clients. The types of people who work at PARAGRAPH are strategists, anthropologists, artists, engineers, entrepreneurs, negotiators, students and builders. Herein lies our value.We are able to look at problems from many different perspectives and apply this diverse point of view to solutions for our clients. After all, if we conduct the same research in the same ways as our competitors, what advantage do we gain? By using old research methodologies in new ways and inventing new methodologies unique to each client’s research objectives, we quickly explore more territory to find insights often overlooked. We believe creativity is the missing link between useful information and actionable inspiration. When the question of what makes something cool comes up, responses range from a specific quality of the thing, person or brand in question, to a response about the “tribe” that subscribes to it, to hedging the question entirely, preferably in French: it’s that je ne sais quoi. None of these are wrong—after all, coolness is in the eye of the beholder—but they’re not particularly illuminating either. So what’s the coolest band, person, or brand you can think of? What makes it cool to you? When asked this question myself, a favorite band came to mind, and pressed to explain why I thought they were so cool, my only response was “because they really do their own thing, but they’re not jerks about it.” Yes, you can take that one to the bank. Still, it’s a tough question. People who research what makes things cool (yes, they’re out there) disagree on what that je ne sais quoi really is. But one thing that stands out is a tension between the coolness of standing out (a la James Dean) and the coolness of fitting in (think Mean Girls). It’s the same tension that exists between people who like a band “before it was cool” and those who discover that band later. What’s at stake in this equation is autonomy, or the adherence to internal motivations regardless of norms and expectations. It’s not simply about discovering something first, it’s about affiliating with a brand/band/idea in the absence of broad momentum of acceptance. Researchers Caleb Warren and Margaret Campbell wanted to test this idea more directly, and decided to focus on autonomy: it can be low or high, but it seemed to factor into almost any definition of coolness they came across. This is a useful observation, but what puts it into perspective is the how the degree of autonomy affects coolness, from low autonomy (eg, mass market) to bounded (eg, craft or niche) to extreme (eg, avant-garde or sub-niche). Back to the always-contentious issue of musical coolness, when participants were asked to read three interviews with actual up-and-coming bands, most of the questions were answered in earnest by the band. The question of what motivated their song-writing, however, was controlled (with the bands’ permission) to fall into one of these three levels of autonomy. For low autonomy, the band explained they were trying to write super popular hits that everyone would love, bounded autonomy had the band writing what came naturally to them with an eye to what their audiences liked, and extreme autonomy had the band intentionally disregarding others’ opinions of them in pursuit of novelty. Participants were divided into thirds, and the bands took turns having low, bounded, and extreme autonomy in the three sets of interviews. Participants were then asked to evaluate the coolness of the bands, and to choose 4 songs to download from a selection of songs from all three bands. As it turned out, whichever band demonstrated bounded autonomy was rated the coolest and had more songs downloaded. The low autonomy band had the fewest downloads and the least attributed coolness, with the extreme autonomy band in the middle. So different is cool, disregard is less cool, and same old is downright uncool. As we stated in the beginning, coolness is largely in the eye of the beholder, but it’s not entirely relative. While most people found middling autonomy the most appealing, the results showed that those with strong countercultural leanings were more accepting of high autonomy compared to those with a more traditional perspective. But Warren and Campbell also showed that autonomy only increased coolness in appropriate situations. Going against the prevalence of Bud Light by picking up a case of Natty Bo is appropriate and cool, whereas countering the norm of memorializing fallen troops is decidedly “not cool.” Maybe the closest equation we have for now is Coolness = Appropriate Autonomy. So basically, cool people and brands do their own thing, but they’re not jerks about it. Jump-starting a meeting, project, or just a conversation can make a person feel like fish out of water—no real hope of help, wide-eyed and gasping for air. Even when it’s not that bad, small talk can feel like a death knell for any possibility of something exciting or interesting emerging. We stagger through our romantic, professional and social worlds with the goal merely of not crashing, never considering that we might soar. We go home sweaty and puffy, and eat birthday cake in the shower. While there were a number of great strategies, the main take away for us was the idea of asking for stories rather than answers. Around our office we frequently talk about reframing a given question to yield a more interesting output. While this can be a difficult task, we found inspiration in the authors’ offering of alternatives to familiar, dead-end questions. What line of work are you in? How long have you been living here? How did you end up in your line of work? Who do you think the luckiest person in the room is? If you could blink and teleport anywhere right now, where would you go? So if we’re thinking about a brand instead of a lackluster conversation, we might try something similar. What do people think of Brand C? How do we get people to buy Brand C? How does Brand C appeal to its base? How do we make Brand C the next Apple? How does Brand C fit into a basic day? What comes before and after? What does buying something in Category C mean to people? If Brand C were a kind of combat, what would it be? (Eg, hand-to-hand, covert ninja, land war in Asia, etc). If Brand C were irradiated and turned into a mutant, what powers would it have? Keep in mind the broadly accepted fact that all mutant powers derive from pre-existing talents or latent qualities. The point is that asking the same old questions will probably yield the same old answers, whereas rethinking the question might result in more interesting research and more effective solutions for the client. Regardless of whether the topic of mutants comes up. Wherever you fall on the spectrum of the value of individuality, what makes us who we are as individuals is a curious question, and how it plays out around us is equally worth exploring, even if ultimately we’re all walking compost fodder. Consider what makes you who you are, and what makes the person next to you who they are. What qualities or characteristics come to mind? How do we, as researchers and creatives, approach and appeal to individuality? If we view it as coming mostly from the inside—a kind of genetic or psychological framework we emerge from, what then? This is what Fitbits and mattresses that tell us our sleep habits tap into. What if instead the emphasis is on the ways we project our uniqueness with what we wear and how we mold our exterior? Canary yellow eye shadow and the continuance of seersucker in any form can be attributed to nothing if not our need to signal our “selves” through fashion. Or, what if we view individuality as something based on our choices: our careers, our art, our love of Russian literature? The idea that we’re the topline list of our achievements and hobbies—doctors, home chefs, fly fishermen—first and foremost, and why we might invest hundreds of dollars in Rosetta Stone language software. On a broader level, how have ideas of individuality—what constitutes it and how desirable it is—have changed over time? As people try to distinguish themselves ever more from the crowd, what forms is it taking? This is what we explore in the first installment of our Slow Culture series. We look at various facets of the changing face of individuality with the hope of illuminating some of what’s gone on and where things might go in the future. “Good artists borrow, great artists steal” Picasso is commonly said to have uttered at some point. Whether or not he said this, or stole the quote from someone else, it’s pretty accurate. Shakespeare, who could run against anyone for Most Creative Person Ever, is well known to have used foreign plays or histories for all but a few plays. He didn’t cite anything because that’s just not what you did at the time—there was no internet and no copyright law policing ideas. These days most people don’t take too kindly to idea thieves, clever or otherwise (just ask Jonah Lehrer). So how do we get the benefit of multiplied perspectives without the mess of copyright infringement and ethical violations? Diverse collaborations, that’s how! Instead of going it alone and depending on your knack for lateral thinking (which, even in the most flexibly-minded of us, is limited), working with people from disparate backgrounds can expand and enrich the creative component of any project. While it’s generally true that a career’s worth of sustained vertical thinking is what wins Nobel Prizes, cross-discipline collaborations yield some of the most interesting and innovative results. Take, for example, the first algae-powered building, unveiled last summer. This revolutionary building was created by engineers, architects, biologists, and artists from three different companies. Alone, none of them could have pulled it off. Ultimately this is the kind of collaboration is necessary to solve puzzling problems, big and small, whether it’s how to build and power sustainably or how to help an existing brand venture into a new category. It’s how we do things at PARAGRAPH as well. When our multi-disciplinary team sits down to tackle a new problem, we bring our own unique backgrounds to the strategy table, and our research is all the more interesting for it. So, to sum up, collaboration: it’s the next best thing to plagiarizing people who are smarter than us. When passers by kept snapping pictures of the witty quotes posted outside Division of Labor’s office, things like “No Good Comes from Hitting Reply All”, they realized they were on to something. And when they decided to shore up the resulting book-length collection of similarly clever posters with some research, they came to us. We surveyed 800 office workers across the country, asking questions on subjects varying from coworker peeves to office-related indiscretions. Now we’ve gone back and taken some of our favorite bon mots and done a little more research, and explored them a little further. Enjoy! Imagine you’re working with a group of people to solve a problem. It probably happens most work days in some fashion, but let’s say you don’t know the people. Say you’re on your way to the mountains and a herd of cows is blocking the two-lane road to your Airbnb chalet. You’re so close, but so far. There’s three people stuck there with you, and you debate the best course of action. One guy declares confidently that if he honks the horn a lot, they’ll run. Another guy quietly says that might not work. But Over-Confident Guy insists, so you all get into your cars while he tries it. After the stampede subsides, you all get out to survey your cars for damage, of which there is plenty. Also, it turns out that the quiet guy lived in Wyoming for 10 years and knew a lot of ranchers who would have told you that would happen, but he wasn’t the one sounding off about the best way to do things. So here’s the question: how do we choose the best course of action when working in a diverse group with multiple options on the table? Figuring out who the experts are in a given situation is crucial: if you’re planning a ski vacation, you need to talk to the powder hound who’s been to the most mountains; if you’ve got an idea for a start-up, you need to talk to someone who’s made one work, and knows why and how it worked when it did. Obvious, right? Sometimes these people are easy to track down, but some situations make it more difficult. For example, take group work. Most of us work or consort with someone who we tend to believe by default. It’s the person who says “sure” rather than “really?” to a new perspective in a conversation, the one who oozes confidence in every situation, even those they’ve just walked into. They seem to have a response to everything, and to know the answer already. Seem to. Often there’s no clear expert at hand when working in a group to solve a problem, so the person who exudes the most confidence becomes the de facto leader for the simple reason that others don’t challenge him or her. It’s a common group dynamic: someone leads the way, but whether that person is qualified to do so is questionable. Bryan Bonner, a researcher from the University of Utah, wanted to understand how this dynamic plays out, and whether something can be done to make group work a more useful, profitable undertaking. Bonner and his colleagues had people working in groups come up with 5 knowledge-based estimates (e.g., the distance from Salt Lake City to New York City). While some groups dove in without any further instruction, others were told to have each member think of and write down two things they knew that were related to the questions before continuing. This task functioned as a short hand inventory of related expertise, so the group could distinguish the people who knew more (for instance, someone who took a road trip to the east coast one time) from those who knew less (the guy from California who’d never been east of the Rockies). What they found was that groups who considered members’ knowledge before getting to work had more accurate answers than the other groups. Groups who didn’t consider member knowledge were more likely to be influenced by the members who showed the most confidence, and researchers noted that knowledge and confidence were “only modestly related to one another” in their study. It makes sense when you think about it: everyone works with a different set of knowledge and experiences. Why wouldn’t they be used accordingly, depending on the situation, rather than the usual falling in like with Over-Confident Guy every time? Quickly going over relevant knowledge before beginning a project seems like 3 minutes well used. And what do we have to lose? Nothing but a few hours of wasted time. Focus groups can only tell us so much. In many instances, what consumers say in the discussion is completely different from what they do outside of it. Look for ways to pinpoint a contradiction between what customers say and what they actually do. If successful, profound truths that change the way we think about our customers can be revealed. "Truly great creative achievements require hundreds, if not thousands, of hours of work, and we have to make time every single day to put in those hours. Routines help us do this by setting expectations about availability, aligning our workflow with our energy levels, and getting our minds into a regular rhythm of creating. At the end of the day--or really, from the beginning--building a routine is all about persistence and consistency. Don't wait for inspiration; create a framework for it." One thing we’ve all had friendly disagreements about is what, exactly, a cloud looks like. I say it’s a puppy crouched down to play, you say it’s a scorpion ready to strike (which says a lot about our personalities, by the way). Things in the sky are like nature’s Rorschach ink blots—a group of stars look like a crab or a bear, or at least did to someone at some point. So what do you make of this? 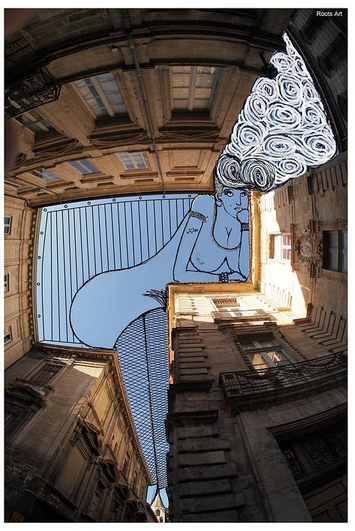 The reason Thomas Lamadieu’s work caught my attention is not because it’s a playful use of negative space. Rather, I’m intrigued by how a set of given parameters (in the physical sense), became the foundation for something so wildly different and interesting. 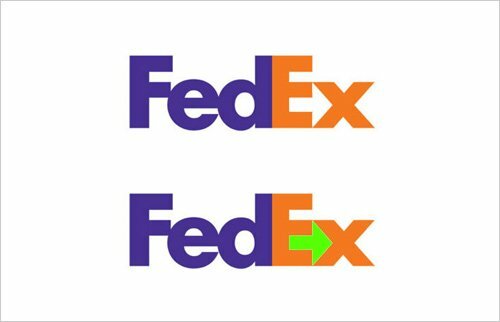 It’s not that there’s obviously a woman sitting in that space (as with the arrow in the FedEx logo), but it does make sense how one grew into it, imaginatively. We’ve been talking about structure around the office lately, and how to make it work for rather than confine us. Deciding that a certain amount of time will be devoted to creative endeavors is a great idea, but we’ve noticed that often our internal projects get brushed aside because they’re not “urgent,” and so get put on the backburner for a while. It turns out that a while can easily turn into forever, as we’ve all discovered at various points when we take a look back and see the detritus of unwritten stories, unplanted gardens, DIY projects that never get off the ground, blogs left to die—the list goes sadly on. Perhaps a solution to this common quandary is to install some hemmed in space into the week and just go for it. Dig into those projects (and only those projects) during that time period, which is to be considered inviolate. We’re going to try it out and see how it goes. In the mean time, here’s once more sky drawing for the road. I don't know about you, but what I see when I look at that space now is an opportunity to expand.